If you will be entering college this fall, one of the best ways to get acclimated in your new environment and better determine which field you want to go into is to partake in a mentoring program. Boston, a city full of well-respected educational institutions such as Boston University and Boston College, offers a number of college mentoring programs for students that want to get on the right path early in their academic careers. 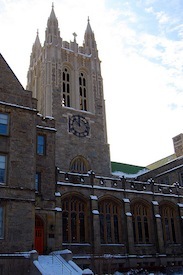 College Bound Mentoring Program at Boston College: This program is designed to help incoming college freshmen receive the additional support that they need in order to have a successful college experience. Through this program, one to two incoming freshmen are paired with a mentor that is currently an undergraduate student at Boston College. Through this mentoring arrangement, the mentor will meet with the mentees for two to three hours each month to discuss future goals pertaining to their career and college choices. CAS Peer Mentors at Boston University: This mentoring program is coordinated by the College of Arts and Sciences and Leadership Office at Boston University, and its intention is to help college freshmen make an easier transition to life at college. The peer mentors are existing undergraduate students that introduce new students to resources, academic policies, extracurricular activities, workshops, and student support groups. To learn more about these college mentoring programs or how a mentoring relationship in general could be beneficial to you, please contact us at the Over My Shoulder Foundation. If you enjoy the content provided by Over My Shoulder Foundation, contact us! SHARE your mentoring stories, consider donating to our non-profit, and don’t forget to follow Over My Shoulder Foundation on Facebook, too!